During an interview with a Alan Smith, who is a suspect in the murder of his estranged wife, his girlfriend made the comment, “But is the possibility and the capability there? 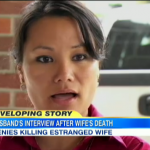 Yeah,” in regards to whether she believes that her boyfriend had any involvement with his wife’s death. Dan appeared on Good Morning America to discuss what Love Thai’s comment means for Smith’s innocence. Dan says, “The notion, she is saying publicly, ‘You never know. It’s always possible.’ This is crazy. You’re doing an interview with her? And she’s coming out and saying, ‘Well, it’s possible. You never know.’ Maybe he did kill his wife. As we saw in the piece, a lot of circumstantial evidence. And also, beyond just the circumstantial evidence. It’s also the circumstances, right? You have stab wounds. You have blunt-force trauma. Those tend to be immediately someone that the person knew here. And 19 stab wounds, etc. Number two, Google searches for things like fake passports and would Venezuela extradite?” Watch segment here.